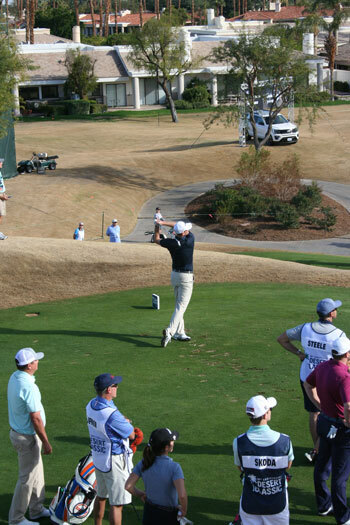 Brendan Steele tees off on the Nicklaus Tournament course at PGA West in La Quinta. Brendan Steele posted 11 under par for the four rounds at The Desert Classic in La Quinta last week: 69-69-67-72 — 277, which tied for 57th place. The Idyllwild native’s drives averaged 298.9 yards and found 73 percent of the fairways, but he hit only 56 percent of the greens in regulation. Although he lost 2.137 putting strokes to the field, actually it felt as if he putted well all week. This reporter estimates he saw 8-10 lip-out putts by Brendan that, had just half of them dropped, would have made a big difference in his score. Brendan’s highlight shot came Sunday at hole No. 18 on The Stadium course, when he pitched in for birdie from the left intermediate rough 52 yards out. 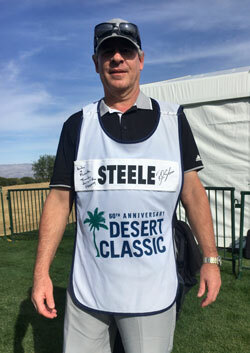 At the close of play on Sunday, Brendan thrilled Montreal Superfan André Pilon with an official “Steele” caddie’s bib from The Desert Classic tournament, saying that André deserved it more than anyone. Word is that André still had not taken it off by press time on Tuesday evening. Brendan plays this week in the $7.1 million Farmers Insurance Open at Torrey Pines in La Jolla. He tees off Thursday on No. 10 South at 9:20 a.m. And Friday on No. 1 North 10:20 a.m.. He’ll play with Patrick Cantlay and Chris Stroud both days.